Request and approve time off in Microsoft StaffHub – Share your feature requests and ideas for improving Microsoft StaffHub. The feature teams working on StaffHub regularly review the ideas you submit, incorporating them into their work to make your experience even better. 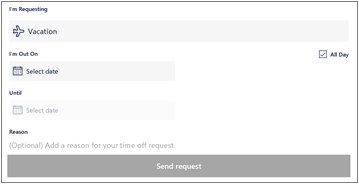 Employees use the Microsoft StaffHub mobile app to request time off. Managers approve or deny these requests through the StaffHub mobile or web app. Once approved, time off will be blocked out on the schedule automatically. Managers can also block out the time manually. Tap + > Request time off. Enter the date(s) you will be off and any optional notes. On the confirmation page, view the progress of the request and whether it was approved or denied by your manager. Once your manager approves or denies the request, the page will update automatically and the time off will show up in the schedule. Log in to Microsoft StaffHub. Select Schedule to open the Schedule page. Select the shift you want to edit > > Add time off. 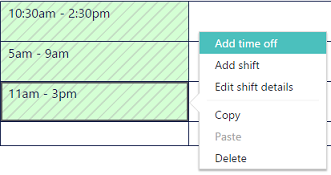 Optionally, you can assign a color or add notes to the assigned time off. Select Save and the schedule will be updated. Open the StaffHub mobile app > Requests. Tap the time off request that needs to be reviewed. Click Approve or Deny to respond to the request. Send an optional message with the response. On the Schedule page, select any time off request. Requests are indicated by a yellow box. Enter an optional message and then select Approve or Deny. Once approved, the time off will be added to the schedule automatically.